One of the keys to consistent messaging and brand voice is having an in-house style guide, even if that guide is just plain ol’ AP style. The drawback to style guides is that, frankly, few but the wordsmiths reference them and they’re not always super accessible (who wants to carry around AP Stylebook or wade through docs to find the in-house guide?). Luckily, there are apps for that. In searching, we only found three of them, but they should be able to at least cover your basics. Here’s our mini-roundup of style guide apps. AP style is the stalwart style guide of newsrooms and the jumping-off point for most corporate style guides (at least in my experience). If you don’t want the bulk of the old-school paper version, AP has you covered with their iPhone app, though at $24.99, it costs more than the paper copy. The app covers all your favorite spelling, grammar, punctuation, usage, and style guidelines and includes audio along with phonetic pronunciation guides. This new (and free!) Android and iPhone app puts a lot of your most burning language and usage questions right next to your Facebook app. It’s got plenty of handy entries about hyphens, ampersands, and more, but be aware that it is its own style guide and is British (for example, they prefer the British “per cent” over the American “percent,” and both of them over “%”). But it’s got great information, a section where you can input your own writing for a readability analysis, and even a fun writing trivia quiz. APA, aka the American Psychological Association, has its own manual of style, and its own app ($2.99) of the manual. OK, this one might not be as immediately helpful to public relations pros, but the style guide is used by a number of scientific and academic journals and textbooks. Do you have another writing or style guide app you use? Over the past few months, they’ve alerted us to the newest revisions: there was the aforementioned “over/more than” debacle; state names should now be spelled out instead of abbreviated in the body of a story; and it is now “Wal-Mart” in all instances. We’ve written about media styles (and using AP style in the digital age) before, but it’s worth revisiting why the AP Stylebook is so important for public relations professionals. Following AP style rules (like most journalists do) makes it clear that you care about the English language, which in turn makes you look smart and shows you care about your readers. You want to be known in the newsroom, but not as the flack who send press releases that require heavy editing. Sending clean news releases that adhere to AP style makes journalists much more likely to read your release without feeling itchy inside. That will, in turn, make them more amenable to working with you. That doesn’t mean that one AP-style news release will get you a mention, but consistent good writing can only help your cause. 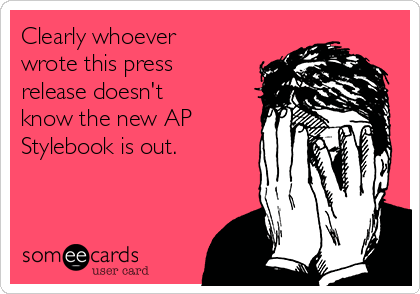 Following AP style will improve your writing both in and out of press releases. Referring to the AP Stylebook as you write means you’ll be paying more attention to your writing, which can only improve it. Familiarizing yourself with AP style and adhering to it means you’ll also be on the lookout in your colleagues’ writing, which will also make you a better editor. It’s true that I have a soft spot for both grammar and AP Stylebook (they don’t call me @ellisredpen for nothing), but I’ve also been a journalist and am the offspring of two of them, so I know of what I speak. Remember: friends don’t let friends capitalize job titles when they appear after a person’s name.